Learn new English words without much hassle! – The "Not so Useful Blog!" Ah, so long, but wait is sometimes good (I’m not saying it’s going to be good this time though :grin:). Anyway, moving to the blog post of the day (or should I say month, given the last post was on Nov 21st? :???:). Now, we all know how to read and write in English (I mean or how else you’re reading this post and I’ve written it? Chuck Norris :roll:), but when it comes to use right word, most of us simply fail. Just for example, I’ve used the word right instead of appropriate in last sentence, but appropriate was more, well, appropriate! And sometimes, people also get confused with the words. A friend of mine loves to call himself Simpleton thinking it’s very simple person! So, how we improve our limited English vocabulary? It’s simple, we learn (Eureka, huh :evil:), but in slightly interactive way (Hmm, listening, aren’t you?). Below are the 3 websites that can help you grasp more words relatively easily (just relatively, you won’t become Shakespeare in one day :!:). It’s one of the most intuitive website I’ve ever seen in learning space. 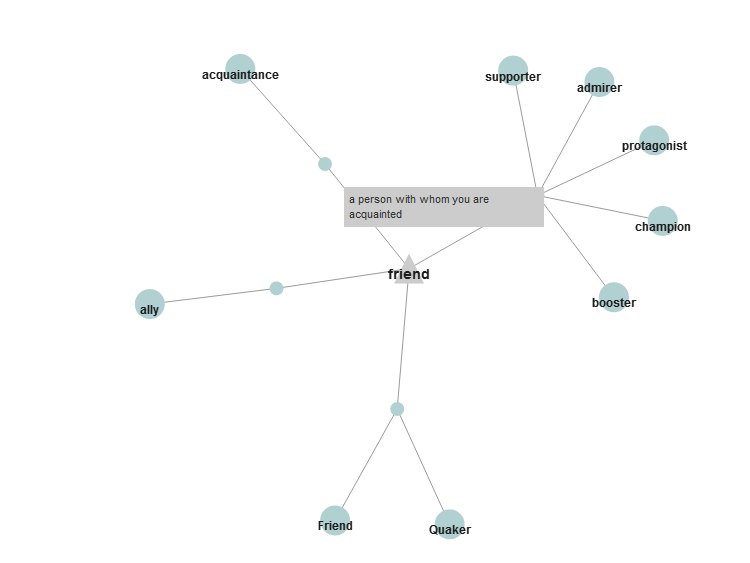 Graph Words is, by definition, a online interactive English dictionary and thesaurus that helps you find the meanings of words and show connections among associated words. If this goes over your head, just like it did in my case, it’s simply a graphical representation of the words you search with the possible synonyms. Your searched word is connected to it’s set of synonyms and the connection tells you the meaning of word. So, you know what exact word is to be used in the given situation. Well, name says it all. It’s great vocabulary resource. But the interesting part of the website is when you visit, it present you with objective type assessment with point system. This assessments, although contains simple words, helps in knowing words and it’s use in pretty decent manner. But the fun gets multiplied when you enter the website. By default, they compare few similar looking words (remember simple and simpleton? :twisted:), but as you search, you’ll get the word suggestion (don’t need to remember spellings, wow!) and once selected, the you’ll see full page for the given word explaining everything about it. Quite cool, isn’t it? Although the site says it’s a Free Vocabulary test Prep for GRE, GMAT, TOEFL, SAT, but you can use it for any purpose (they haven’t restricted us from doing so, I swear). This is the only website I find till now which has famous GRE flash cards, and it’s quite awesome! You can learn new words quickly and the use it to revise as well. Generally, there’s not much help in this section apart from the meaning of the words and it’s use in one sentence, but fret not, any further details needed is taken care in subsequent tests this site has. There are quite a varied selection of tests covering practically everything related to the words. So, with these websites, I think you’re practically covered. Learn about a word through Vocabulary, get it’s meaning graph through Graph Words and finallyprove your skills on Learn Word List and you can call yourself pro! And before I part away, You can always use Google’s define method for quick reference.